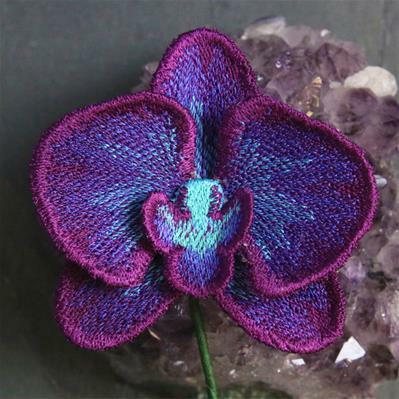 Fans of the Soft Petals Rose and Supple Succulent will love this gorgeous orchid embroidery design! Each piece of this unique flower is specially digitized to hold together on its own. 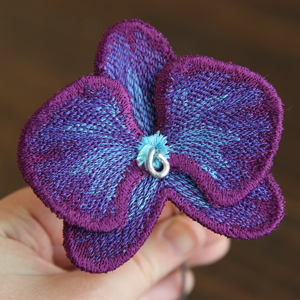 Stitch in a beautiful combination of vivid colors, then assemble -- we'll show you how! 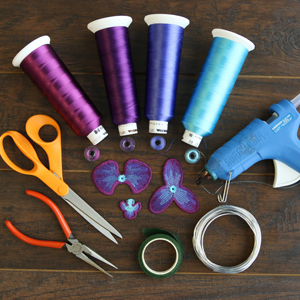 Begin by winding a bobbin for every thread color used in the design. Embroider the three freestanding pieces onto heavy duty water-soluble stabilizer. 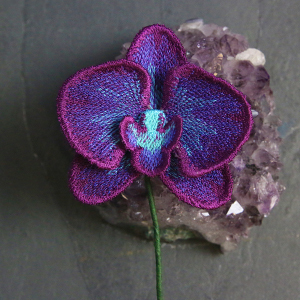 The orchid will be assembled on a piece of wire. 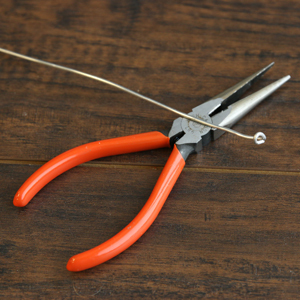 Cut a piece of 12 gauge floral wire to 10" in length using a wire cutter, and curl one end of the piece of wire with a needle nose pliers. 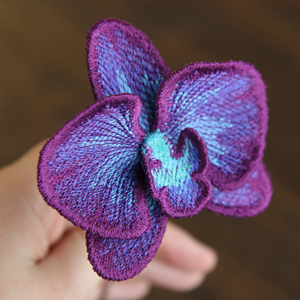 Next, slide the lace piece with two petals onto the wire with the right side of the lace against the curled end. 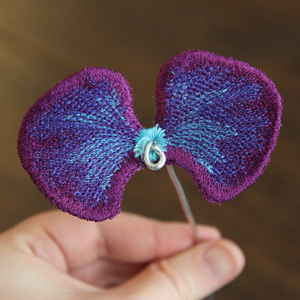 Use a glue gun to adhere the center of the lace to the curl of the wire. 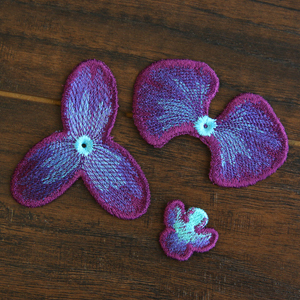 Add the second lace piece with three petals onto the wire as well, making sure the right side is also facing the curled end. Secure the two lace pieces together with glue around the wire hole to ensure the petals won't spin, separate, or fall off the wire. Take the last little lace piece, and hot glue it to the front of the flower, covering up the wire's curl. 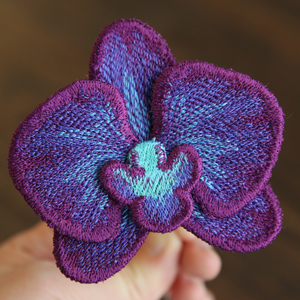 Once the glue is dry, bend and curl the lace pieces as desired to make the lace orchid 3D. 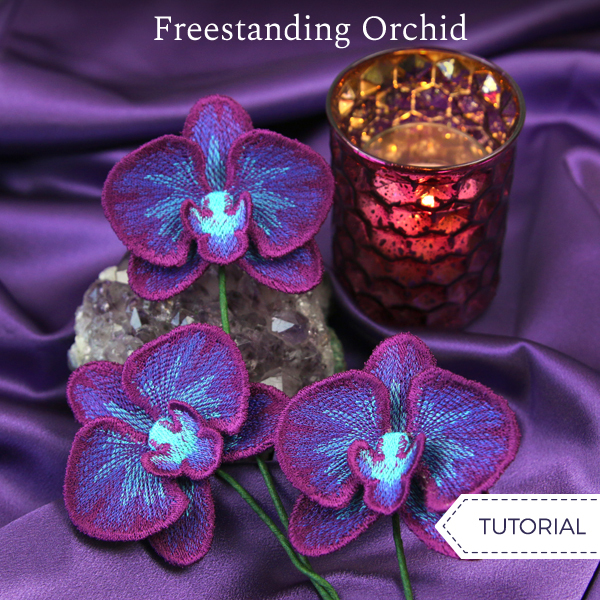 Finish off your 3D orchid by wrapping the wire with floral tape to make a beautiful stem. 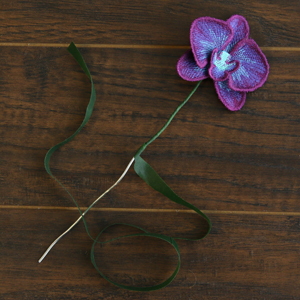 Let your pretty stitched orchids bloom around the house, or turn them into unique accessories!